This cool contemporary futon frame will give your spare bedroom or den a stylish look. The sleek metal arms gently arc into simple square legs, with a smooth frame all in a Nickel metal finish. Easily convert from a couch for lounging, to a comfortable bed at night, ideal for overnight guests. Make the most of your space with this stylish futon. 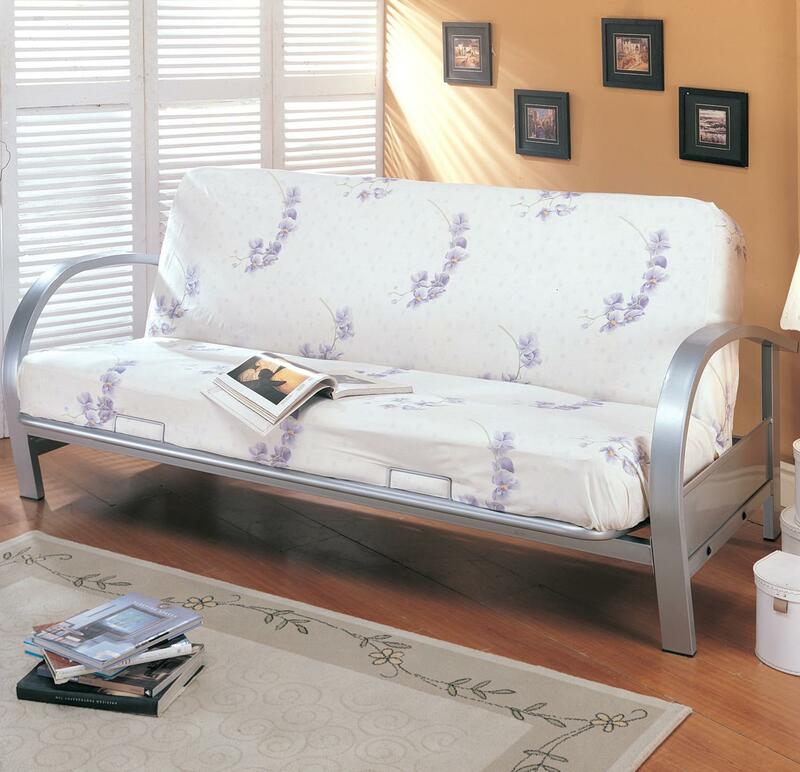 The Futons Contemporary Metal Futon Frame and Mattress Set by Coaster at Rife's Home Furniture in the Eugene, Springfield, Albany, Coos Bay, Corvallis, Roseburg, Oregon area. Product availability may vary. Contact us for the most current availability on this product. 7251 Futon Frame 1 80.5" 54" 33.5"
2002 Promotional Black Futon Pad 1 54" 74" 6"
Choose from a variety of futon styles to meet your needs. Add one of these futons to a spare bedroom, den, or dorm room to create a great multi-functional space. Perfect for relaxing, reading, watching television, or playing video games by day, these futon frames convert easily to a double bed at night. Make the most of your space with a futon! The Futons collection is a great option if you are looking for furniture in the Eugene, Springfield, Albany, Coos Bay, Corvallis, Roseburg, Oregon area. Browse other items in the Futons collection from Rife's Home Furniture in the Eugene, Springfield, Albany, Coos Bay, Corvallis, Roseburg, Oregon area.